Just scored some last minute tickets to Calgary. We plan to tour Calgary, Banff, Lake, Louise, and Jasper. We'll be doing a lots of hiking in the Rockies and kayaking on the many pristine lakes. Any restaurant suggestions? Leaving in the next 72 hours. We took a short vacation to Banff last October. We loved the area (make sure to make the trek through the IceFields Parkway--we drove from Banff to Lake Louise to the Columbia Icefields . . . It's an amazing drive with lots of good hiking spots along the way). In terms of food, we had better luck with the higher-end meals. We loved our meal at Eden (in the Rimrock Hotel). We had the full-on tasting menu (at least ten courses) and opted for the wine pairings. The food was complex and unique, and while our memories have faded as to what we actually ate, we both remember being stuffed and more than satisfied after our three hour dining extravaganza. For whatever reason (perhaps the time of year? ), we were nearly the only people in the restaurant on a Friday night. The service was laid-back and pretense-free, and before the sun set we had great views of the mountains from our table. Our waiter/sommelier was quite fun, and did a wonderful job of describing the characteristics and provenance of the wines we were being served. It probably didn’t hurt that he offered to split the pairings for us, but still poured healthy portions for us both. The sommelier and chef were about to journey to Chicago to sample our city’s dining highlights, but we enjoyed our overall experience more than the tasting menus at Tru and Avenues. On a side note, that night began my fiancé’s theory that all butter should be made with goat's milk, and I can’t say that I disagree. We stayed at the Banff Springs Hotel and on another evening had a meal at their signature restaurant, the Banffshire Club. Perhaps it would have been more memorable had we done the tasting menu there, but my recollection is of a considerably stuffier atmosphere and certainly less memorable service. We ordered game-based entrées, which were enjoyable but not so good that we would call this a “can’t miss” spot. We had breakfast several times at Melissa’s in the town of Banff. Good, high-quality, hearty breakfast fare at a reasonable price. We quickly learned that the more convenient spot, the hotel’s buffet, was so-so but way overpriced. Enjoy your trip! We look forward to going back sometime. 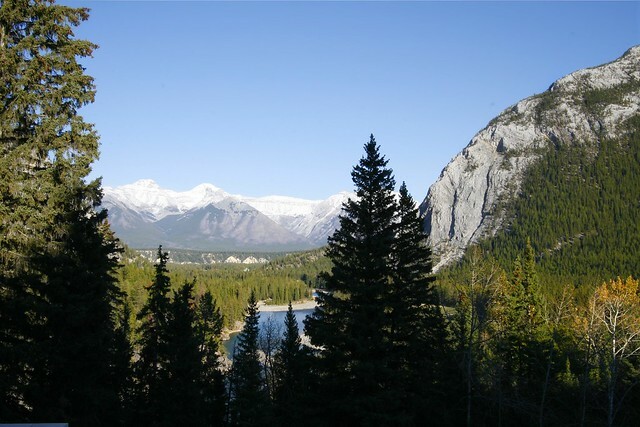 We've spent several vacations in this area, with and without kids, and the beauty of the land there is awe-inspiring; the mountains and glaciers there are so spectacular they really defy description (on the Icefields Parkway, the drive between Lake Louise and Jasper, in particular.) Calgary has great Chinese food -- we had a fantastic meal at a place called the Silver Dragon; it's well known in Calgary and they have a sister restaurant in Banff (same name, also good.) 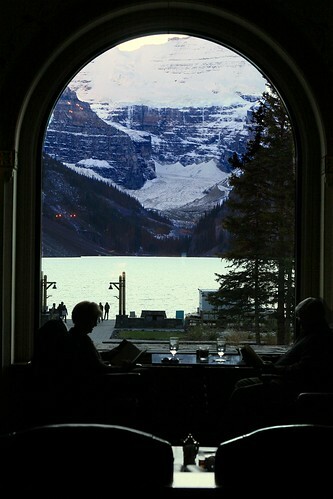 Have a drink at the bar in the Banff Springs Hotel to see the view of the falls there. In Lake Louise, there is a take-out place in the town square (don't remember the name there, but it's the place everyone goes to) which is great for sandwiches and brownies etc. to take with you as you drive up the Icefields Parkway. Our favorite hikes: Bow Lake -- don't miss it; hike past the tour buses and all the way to Bow Falls (eat your sandwiches there.) Parker Ridge -- this time of year it won't be crowded and you'll get incredible views of glaciers at the top, another hike not to miss. You can skip the snow coaches and do the hike instead above the glaciers to Wilcox Pass; again, astonishing views and you'll avoid the crowds waiting for the big buggies. Jasper has a nice fish restaurant called Fiddle River; otherwise the food at the various restaurants in town is fine but nothing stands out. In Jasper, drive up the road that goes to Maligne Lake, or the road to the ski lift off 93A, at dawn or dusk and you will likely see bull elk and quite possibly bears -- we once watched a mother and cubs by the side of the road for several hours. (We were last in Alberta in 2002, so I can't say for sure if all the restaurants are still there; I'm hoping the glaciers are, but they going fast.) I hope you have a great time; it's truly a special place and I want to hop on a plane right now and go there myself. Ek and ToniG, thank you so very much for your recommendations. We will definitely hit some, if not all of your places during our two week adventure. One more thought, by the way, if you plan to spend any time in Calgary and have even a passing interest in dinosaurs or would like to see some different terrain: it's worth the two-hour drive or so east to get to the town of Drumheller and the incredible dinosaur museum there (the Royal Tyrrell, http://www.tyrrellmuseum.com). It's a very new museum, set in the Alberta badlands, where they are still in the midst of important fossil excavations. It's state-of-the-art dinosaur display in the museum, including an exhibit on the Burgess Shale (which you can hike to, not too far from Lake Louise in BC) which is mind-boggling, and I'm not all that into fossils (or wasn't before we visited there). Then the landscape around the area is engrossing too, similar to the South Dakota badlands. But there are no good hotels in the town and no decent restaurants, either (though it's worth noting that you can climb to the top of what's purported to be the world's largest dinosaur -- not part of the museum) so you're better off staying in Calgary and driving in. Time to resurrect this thread. We'll probably be staying in Lake Louise and doing a lot of day hikes. We're up for almost any kind of food...high-end, low-end, and everything in between. And almost any kind of cuisine: Canadian, Paraguayan, Mozambiquan, Orkney Islandish, Malian, Kyrgyztani, you name it. Seriously: we're equally happy at local mom-and-pop joints and prepared to drag along dress-up outfits. I imagine there will be days when we'll have definite preferences and days when we won't. We probably won't be spending any time in Calgary, but will happily drive to Banff or Jasper. Unfortunately, my only experience in the area is about a decade ago and I'd been hiking in the backcountry for two weeks so almost anything looked good! I spent some time in the area a number of years ago, so I can't give specific suggestions, but I do recall that Banff had a number of good options downtown. Jasper had a few, though nothing like Banff, and Lake Louise is really tiny and has few options. The town of Golden, which is west of Lake Louise, has some options, though when I went, there were mostly diners and inexpensive family-run places there. Oh hell, I ain't proud. I'll bump this one last time before we go, hoping for something. We'll spend at least one day in Banff (gotta try the high tea at the Banff Springs, right?) and probably one in Jasper (not overly optimistic, here--but one never knows). Probably a day on and off the Parkway and at least several backpacking around Lake Louise. So: one last plea for expertise on the immediate area. Many thanks in advance to all the world (at least Canadian) travelers (natives?) that I know must be out there. 10 years ago when we skiied there the Post Hotel in Lake Louise had the restaurant with the best reputation, and our meal there didn't disappoint. Might be worth checking to see if this place has stayed true to form. Good luck and please report back on where you end up. We look forward to returning sometime soon! Bumping because I'm going to Calgary next week for a meeting and then heading out to Banff to snowboard for a few days. Any updated suggestions? Though it's not particularly current, you might want to take a look at this thread. (It mentions Deer Lodge in Lake Louise, which we liked a lot.) We stayed at the Chateau Lake Louise which had a number of restaurants. We tried all of them and were so impressed by the Swiss place (the Walliser Stube)that we went back a second time. Also, fwiw, if you're inclined to go to a high tea, we'd recommend Lake Louise over Banff. It's not that the food or service was notably better, but it's far easier to get in and, for our money, the view is better. The Banff Springs Hotel is (in)famous and the line to get in for tea is horrible. As a result, the place was absolutely packed and noisy, and it kinda defeated the purpose of a relaxing tea. Still, the hotel is a stunner and worth the time just to walk around, both inside and out. And its views are hardly mediocre. Sorry I don't have more up-to-date info... You'll have a terrific time (though I'm not sure I envy you the driving this time of year). It has been years since I was there, but I really enjoyed the food at the Sunwapta Falls Lodge. It is on highway 11 about 2/3 of the way between Lake Louise and Jasper. We had one night in Calgary, and ate at Caeser's Steakhouse and Lounge for the DH's birthday dinner. It was an old-school steak house, and they cook the steaks in an enclosed glass-windowed grill room in the middle of the dining room. The steaks were good, but my steak and plate came out so hot it went from medium-rare to medium while I watched. They had a nice wine list, and the service was good. We had lunch in Banff on our way from Calgary to Yoho National Park and ate at Bear Street Tavern. We wanted to sit outside, but the wasps were bad. Nice sandwiches - my Turkey was actual roast turkey, not deli meat. Pleasant place, nice fresh salads too! Neither of us had the pizza, but they looked good. We stayed in Field (Right inside Yoho National Park) at Truffle Pig Bistro and Lodge. They have a nice little restaurant and bar, which seems to be the only bar in town. It's very crowded and can be noisy. They don't take reservations, and there were some bigger groups that took a while to be seated (side note - if it's going to take over 2 hours to seat a group of 8, why not break into two groups of 4). We liked the food a lot, and the service was quite friendly. There was a nice variety of choices. Decent selection of wine and beer, and their breakfasts were great. One night we had dinner at Cathedral Mountain Lodge which is more upscale. It caters to tourists, though certainly anyone could make a reservation. They are not open year-round, they close when their road closes in October. They had a varied menu, a good wine list, and the dining room was lovely - it was pretty chilly so the fireplace was cozy. Lodging prices are over 3 times the rate at Truffle Pigs, and the decor reflects that.